Cochiti Lake: George Torres of Stanley caught and released three channel catfish that weighed in at 9.66 pounds each Mar 16. He was using cut bait. 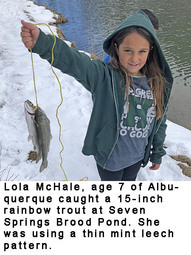 Seven Springs Brood Pond: Lola McHale, age 7 of Albuquerque caught a 15-inch rainbow trout and caught and released several others. She was using a thin mint leech pattern. 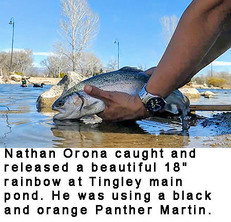 Tingley Beach: Anthony Johnson, age 9, of Albuquerque caught a 17-inch rainbow trout Mar. 15. He was using pink PowerBait. Samantha Akridge, age 11, of Albuquerque caught a 17.5-inch rainbow trout Mar. 16. She was using marshmallow PowerBait. Austin Barnes, age 3, of Albuquerque caught an 18-inch, 2-pound, rainbow trout Mar. 18. He was using a Panther Martin. Charette Lakes: Fishing was good using PowerBait and salmon eggs for rainbow trout. Cimarron River: Stream flow near Cimarron on Monday morning was 10.9 cfs. Fishing in the deeper holes was good using bead head hare’s ears, copper John Barrs and PowerBait for trout. Clayton Lake: Fishing was slow for all species. A few trout were caught by anglers using PowerBait and spoons. The boat ramp is closed due to low water conditions. Conchas Lake: Fishing was fair to good using cut bait and homemade dough bait for catfish. We had no reports on other species. Cowles Ponds: We had no reports from anglers this week. Eagle Nest Lake: As of Monday, the lake remained closed to fishing. For updates, call the state park office at (575) 377-1594. Lake Alice: The lake is completely free of ice, but the water is quite murky. We had no reports from anglers this week. Lake Maloya: As of Monday, there was little open water along the shoreline, but it opens some in the warm afternoon hours. We had no reports from anglers. Maxwell Lake 13: Fishing was very good using PowerBait for trout. A few were also caught by anglers using Fire Balls and spoons. Monastery Lake: Fishing was good using PowerBait for trout. Morphy Lake: Closed for a renovation project on the dam. Work is scheduled to be completed in June, but no firm opening date has been set. Pecos River: Stream flow near the town of Pecos on Monday morning was 66.5 cfs. Fishing slowed with the increase in runoff, but a few trout were caught by anglers using worms and copper John Barrs. Red River: Stream flow below the hatchery on Monday morning was 43.7 cfs. Fishing was good using worms, PowerBait, bead head pheasant tail nymphs, bead head hare’s ears and San Juan worms for trout. Fishing at the hatchery pond was good using PowerBait. Rio Grande: Stream flow at the Taos Junction Bridge was 588 cfs. Fishing was slow to fair using wooly buggers, worms and spoons for trout. We had no reports on other species. Rio Hondo: Stream flow near Valdez on Monday morning was 11.9 cfs. We had no reports from anglers this week. Rio Mora: Stream flow on Monday morning was 13.0 cfs. We had no reports from anglers this week. Rio Pueblo: Stream flow on Monday morning near Penasco was 27.4. We had no reports from anglers this week. Santa Cruz Reservoir: Fishing was fair using PowerBait, worms, pheasant tail nymphs and brown jigs for trout. There is no boat dock in the water at this time. Springer Lake: Fishing was fair to good using streamers, crank baits and spinners for northern pike. We had no reports on other species. Storrie Lake: Fishing was fair to good using PowerBait and Fire Balls for trout. We had no reports on other species. Ute Lake: Fishing was fair to good using liver and cut bait on trout lines for catfish. Fishing was fair using live minnows under a light for crappie. We had no reports on other species. The surface water temp was in the mid 40s. Abiquiu Lake: Fishing was fair using tubes, grubs, crank baits and spoons for walleye and an occasional smallmouth bass. We had no reports on other species. The lake level remains low, and the concrete boat ramp is completely out of the water. Animas River: Water flow below Aztec on Monday morning was 457 cfs. We had no reports from anglers this week. Albuquerque Area Drains: Trout fishing on the Albuquerque (South), Bernalillo, Belen and Peralta drains was fair to good using PowerBait, worms, small plastics and bead head pheasant tail nymphs. A few largemouth bass were caught by anglers using small plastics and worms. We had no reports on other species. Bluewater Lake: Fishing was fair using PowerBait for trout. Fishing was slow to fair using spinners, swim baits and crank baits for tiger muskie. We had no reports on other species. Chama River: Monday morning flows below El Vado and Abiquiu were 29.0 cfs and 279 cfs respectively. Trout fishing below Abiquiu was fair using bead head hare’s ears, prince nymphs and worms. We had no reports from below El Vado. Cochiti Lake: Fishing was excellent using cut bait for catfish. George Torres of Stanley reported that he and his fishing partner Luke Grossetete of Albuquerque caught and released well over 30 catfish this past Saturday. They were using cut bait. Anglers also did well using worms and liver. A few white bass were caught by anglers using crank baits. Our only other report was from Rick Soto of Santa Fe. He caught and released a nice 17-inch largemouth bass on the 17th. He was using a chartreuse spinner bait. Fenton Lake: The lake remains closed to fishing due to unsafe conditions. For updates, call the state park office at (575) 829-3630. Heron Lake: As of Monday, there was a small amount of open water, but it was difficult to access. For updates, check the state park web site or call the state park office at (575) 588-7470. Jackson Lake: Fishing was fair using PowerBait, salmon eggs and worms for trout. Jemez Waters: Stream flow on the Jemez near the town of Jemez on Monday morning was 198 cfs and fishing was slow. Fishing on the Cebolla was good using worms and Fire Balls for trout. We had no other stream reports. Manzano Lake: Fishing was good using PowerBait for trout. Navajo Lake: Fishing was slow to fair using swim baits and deep running crank baits for northern pike and an occasional trout. We had no reports on other species. San Juan River: Stream flow below Navajo Lake on Monday morning was 284 cfs and the water was quite murky. Trout fishing was slow. Seven Springs Brood Pond: Fishing was very good using PowerBait and leech patterns for trout. Tingley Beach: Fishing was very good using PowerBait, Fire Balls, worms, Pistol Petes, Joe’s Flies, spoons and spinners. Fishing was fair using streamers for largemouth bass. We had no reports on other species. Alumni Pond: Fishing was slow with just a few trout caught by anglers using PowerBait and worms. Bill Evans Lake: Fishing was fair using PowerBait and Fire Balls for trout. We had no reports on other species. Caballo Lake: Fishing was fair using cut bait and homemade dough bait for catfish. We had no reports on other species. Elephant Butte Lake: Fishing was slow to fair using swim baits and crank baits for white bass and a few walleye. Fishing was fair to good using homemade dough bait, liver and cut bait for catfish. The best catfish reports came from anglers fishing at night. Fishing for black bass was slow, but a few largemouth bass and smallmouth bass were caught by anglers using, swim jigs, crank baits, spinner baits and creature baits. We had no reports on other species. Escondida Lake: Fishing was fair using PowerBait, homemade dough bait, salmon eggs and Pistol Petes for trout. Gila River: Stream flow on Monday morning was 850 cfs. Fishing was slow for all species. Lake Roberts: Fishing was good using PowerBait, Fire Balls, worms, homemade dough bait and spinners for trout. Fishing was fair using liver and worms for catfish. We had no reports on other species. Rancho Grande Ponds: Fishing was fair to good using worms, PowerBait and salmon eggs for trout. Rio Grande: Stream flow below Elephant Butte Monday morning was .13 cfs. We had no reports from anglers this week. Young Pond: The pond remains closed for cleaning and repair. Alto Lake: Fishing was very good using PowerBait for trout. A few were also caught by anglers using Fire Balls and Pistol Petes. Berrendo Creek: We had no reports from anglers this week. Bataan Lake: Fishing was slow to fair using PowerBait and worms for trout. Black River: Stream flow at Malaga on Monday morningwas 11.4 cfs. Fishing was good using streamers, Fire Balls and worms for trout. We had no reports on other species. Blue Hole Park Pond: Fishing was very good using PowerBait for trout. A few trout were also caught by anglers using salmon eggs and homemade dough bait. 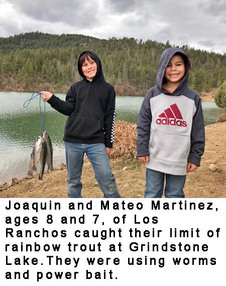 Bosque Redondo Lake: Fishing was good using Kastmasters and Fire Balls for trout. We had no reports on other species. Brantley Lake: Fishing was fair using black plastic worms, jigs and tubes for largemouth bass. We had no reports on other species. Carlsbad Municipal Lake: Fishing was fair to good using PowerBait, homemade dough bait, worms and spoons for trout. Chaparral Park Lake: Trout fishing was fair using PowerBait and worms. El Rito Creek: Fishing was good using PowerBait and Fire Balls for trout. Green Meadow Lake: Fishing was very good using PowerBait, homemade dough bait, worms and spinners for trout. We had no reports on other species. Greene Acres Lake: Fishing was rated as good to excellent by anglers using PowerBait, worms and Pistol Petes. Grindstone Reservoir: Fishing was very good using PowerBait and worms for trout. We had no reports on other species. Jal Lake: Fishing was good using PowerBait and worms for trout. Lake Van: Fishing continued to be very good this past week as several limits of trout were caught by anglers using homemade dough bait, PowerBait, spoons and Pistol Petes. We had no reports on other species. Oasis Park Lake: Fishing was fair to good using PowerBait and worms for trout. We had no reports on other species. Pecos River: Stream flow below Sumner Lake on Monday morning was 58.2 cfs. We had no reports from anglers this week. Perch Lake: Fishing was very good using PowerBait, worms, salmon eggs and Joe’s flies for trout. Ruidoso River: Stream flow on Monday morning at Hollywood was 30.6 cfs. We had no reports from anglers this week. Santa Rosa Lake: Fishing was fair to good using tubes, jigs, creature baits, worms, crank baits and sweet beavers for largemouth bass. Fishing was slow to fair using, tubes, minnows and crank baits for walleye. We had no reports on other species. The surface water temp was in the high 40s. Sumner Lake: Fishing was fair to good using tubes, crank baits, swim baits and jigs for largemouth bass and smallmouth bass. Fishing was slow to fair using crank baits, swim baits, spoons and jig and minnow combinations for walleye. We had no reports on other species. Previous Not the usual team to beat, 2nd seeded UConn is not to be taken lightly as the NCAA national women’s basketball tournament bounces in, with the Huskies in the first round in Albany, N.Y.